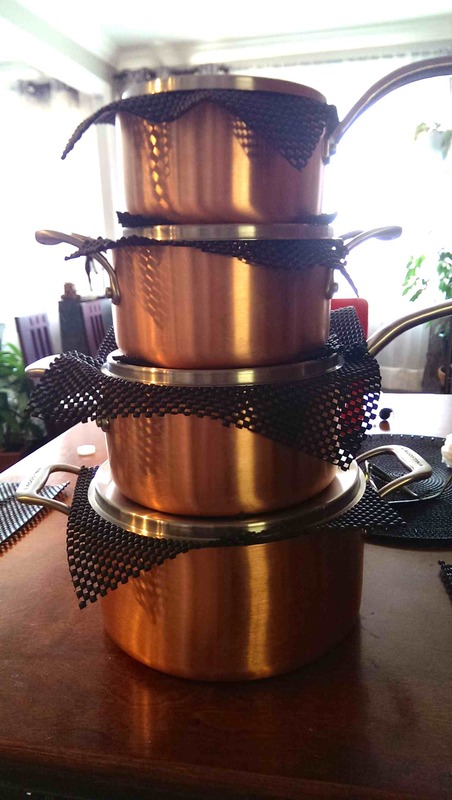 Now that you have a set of those amazing Lagostina copper pots (or some other brand)… how do you take care of them? 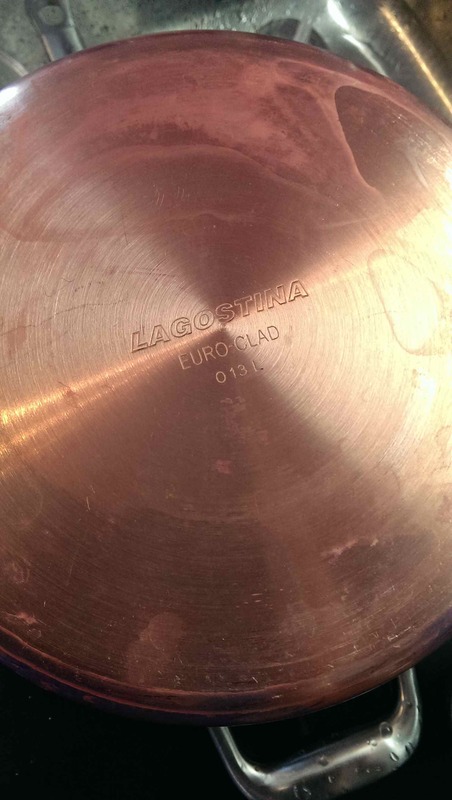 Lagostina cookware fresh from the box ~ so shiny!! The most important thing to remember is to NEVER – EVER put your copper pots through the dishwasher, or use steel wool on them. Persistent elbow grease with a very mild abrasive liquid on a wet sponge will always be your best weapon against spots and discolouration on the outside of your copper pots. It’s normal for the colour to change with heat, food drips down the sides of the pots, water spots when you let them “air dry” after washing instead of drying them off right away. Hey, we all do that… at some point or another ~ Guilty!! At one point I was actually a bit worried with how the heat had discoloured them, giving them a mottled black and blue stained look. They no longer had that bright shiny glow. 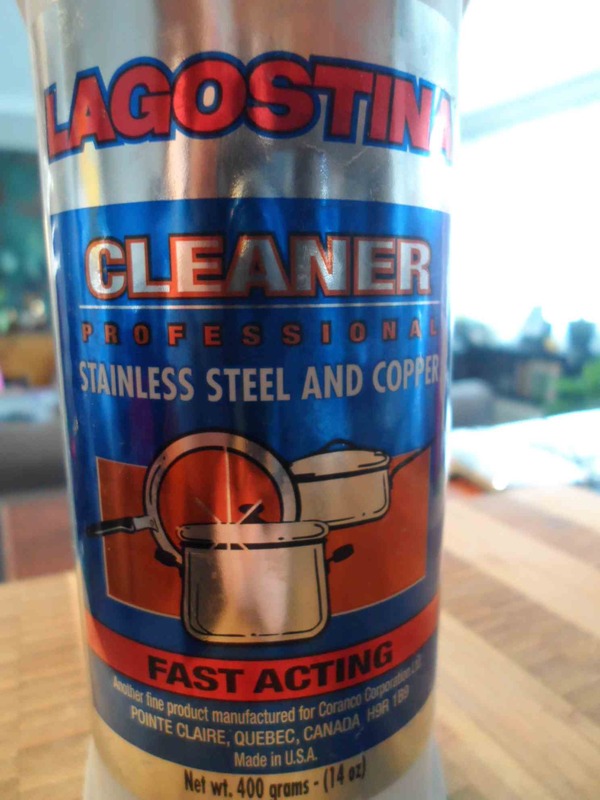 Now, I wouldn’t suggest using the copper care powder every day but, and this depends on how finicky you are with how they look, I would suggest polishing them up once every month or two with the Lagostina powder to make them nice and shiny. This cleaning powder can typically be purchased at your local hardware store or kitchen supply store (Canadian Tire or Kitchen Stuff Plus). Alternatively, you could use a copper cleaning liquid but I find them to typically be very smelly. It just depends on what you are able to find in the stores close to you. 1. Baking Soda & Lemon (not as effective) ~ make a thin paste with water (or the juice of the lemon) and baking soda, then rub with a cut lemon. Wash with soapy water and rinse well. 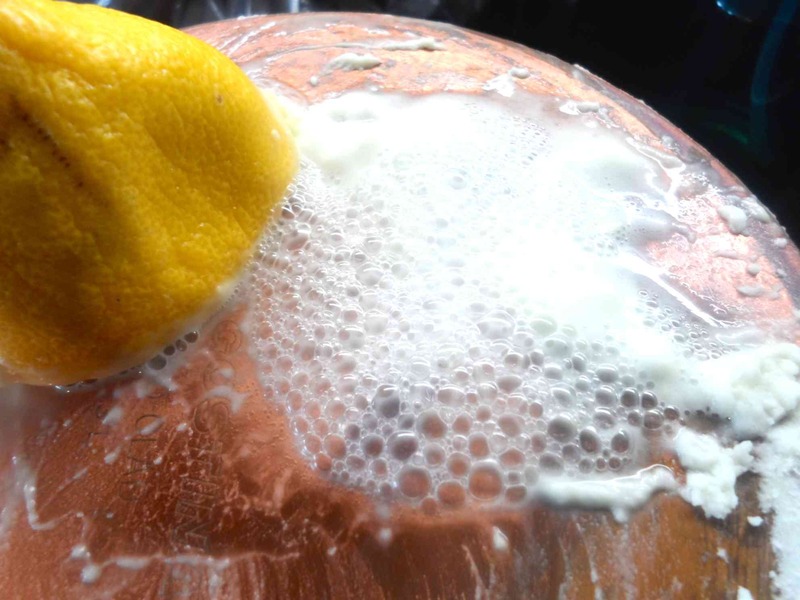 The baking soda will begin to bubble once you add the lemon juice but doesn’t seem to clean very well. 2. 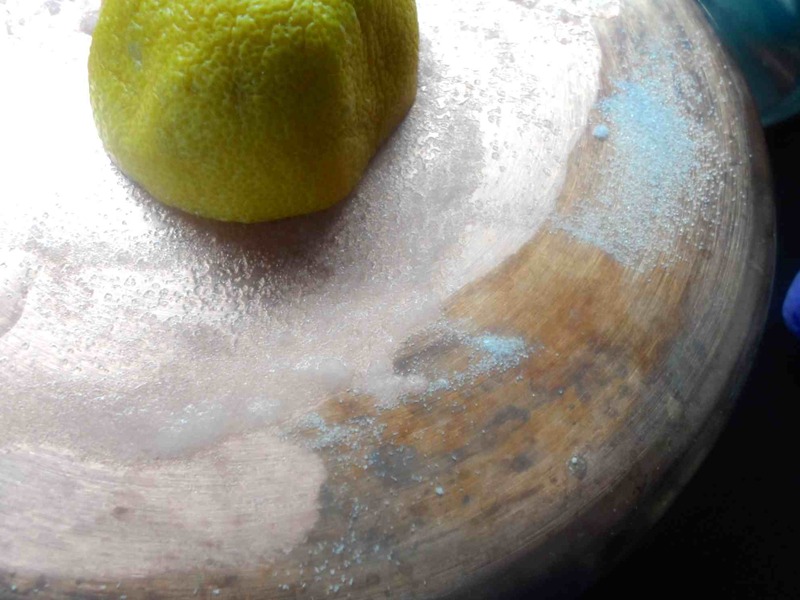 Salt & Lemon (surprisingly effective) – wet the surface of your pot with lemon juice and sprinkle with some fine grain salt. Rub the pot with the cut surface of the lemon. 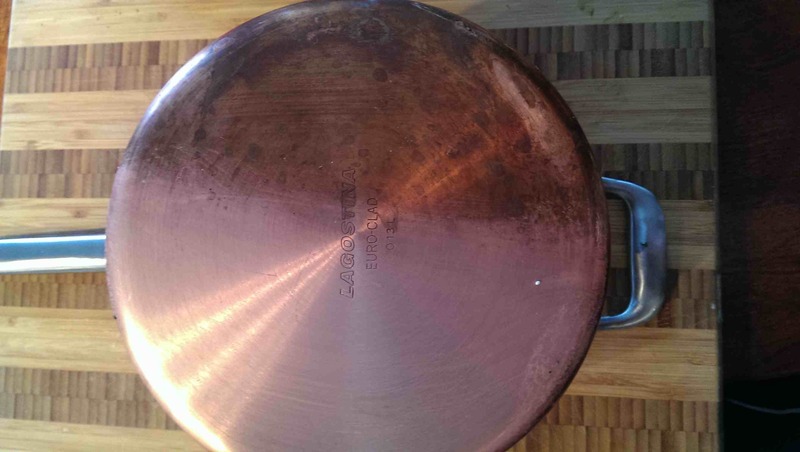 Do not use coarse grain salt or it will scratch the copper surface. Your pots will become shiny almost instantly but it doesn’t seem to get the more stubborn stains out. Wash very well with soapy water and rinse. Salt is corrosive and you wouldn’t want any salt residue to damage the surface of your beautiful copper pots. Whichever method you decide to use, make sure you always wash thoroughly with soapy water, rinse very well and dry completely. Cleaned with Lemon & Salt but still has some stubborn stain marks. Cleaned with Lagostina Cleaner. Note the difference between the cleaned bottom half and the untreated top half. Storing them can be another issue. If you have a pot rack, they’ll look wonderful on display but if you have a tiny kitchen like I do, then stacking them is the only other option. You can stack them inside each other of course and have the lids clutter up a drawer. Or you could get a metal file sorter from your local business supply store and store the lids vertically that way, although the handles for this particular set are quite large. I do have one lower cupboard that is very deep and does not have a shelf, thanks to the pipes that run half way through it. Very awkward trying to figure out how to put a shelf in it. I can, however, stack all of them on top of each other with the lids in place. Although I could stack them all, I found that they made a precarious tower of pots that shifted a lot. I could just imagine them toppling over, bursting the cupboard doors open and clattering across the floor in the middle of the night. Waking up the neighbours and scaring the cat out of one of its nine lives. The solution below came to me one day when I was walking through the neighbourhood Dollarama dollar store. 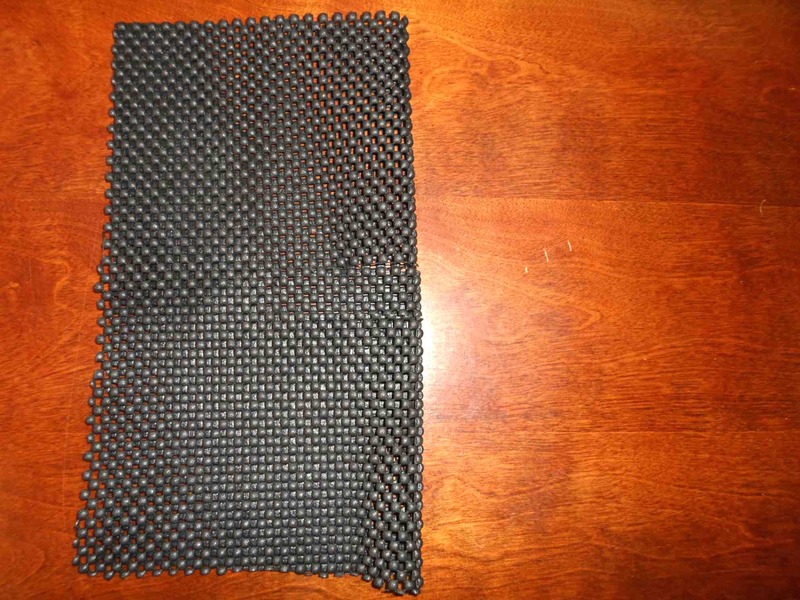 I noticed a roll of some textured, “non-skid fabric” that you would typically line your cupboard shelves (available in various colours) to prevent dishes from sliding, or place under a rug to stop it from sliding across the floor, so why not use it for my pots? It’s really easy to cut into whatever shape is needed and I kept the bigger scraps to put under my cutting boards so they don’t slide across the counter when I’m doing prep work for my latest recipe. 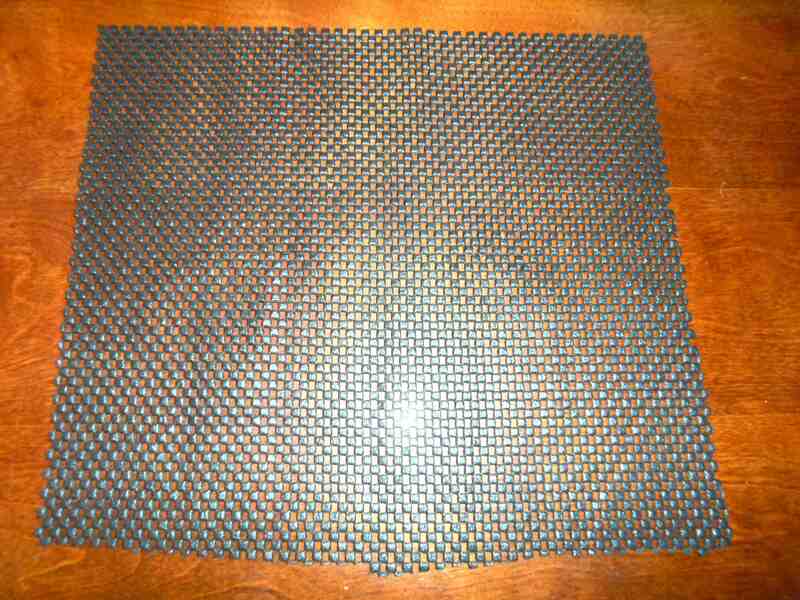 Place each the lid on the surface of the non-skid fabric, or measure each lid and cut a bit larger so that the fabric will hang slightly outside of the pot that the lid fits on. 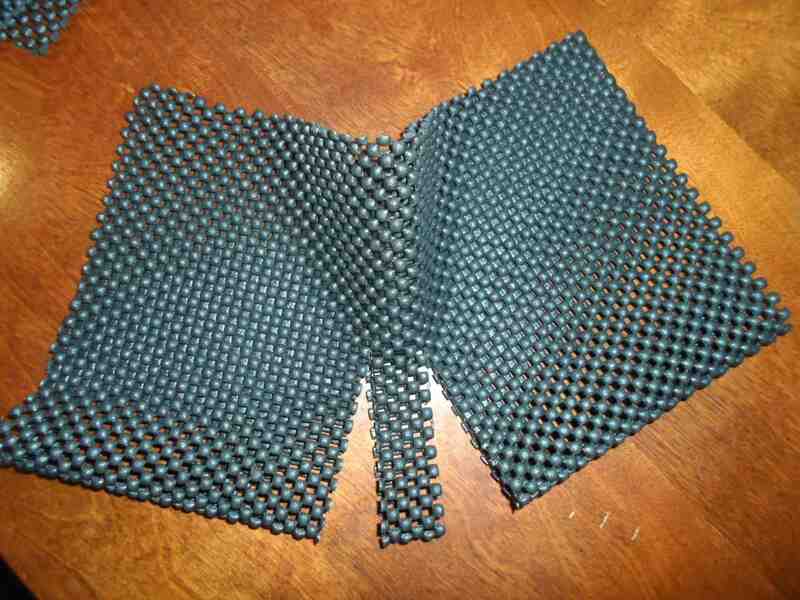 Fold in half and cut 1 or 2 slits in the centre so that the lid can fit through. 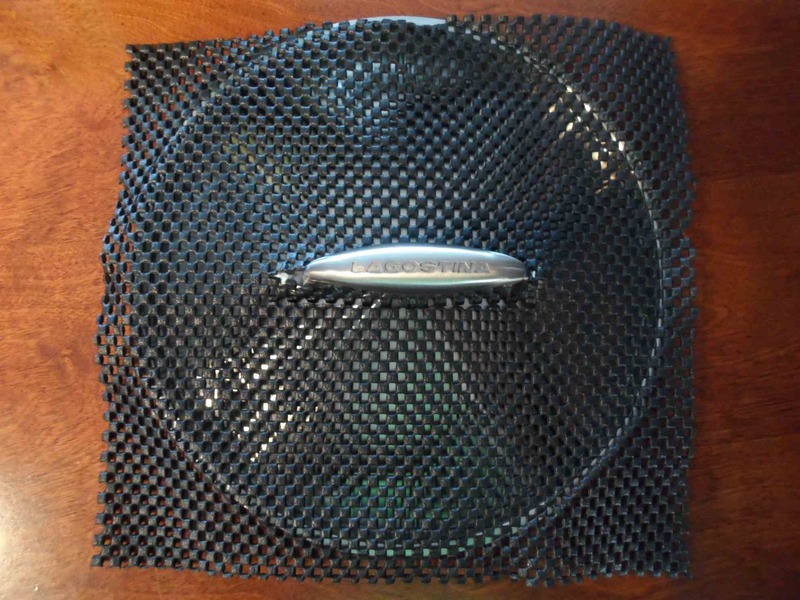 Insert lid handle through cut portion of fabric. 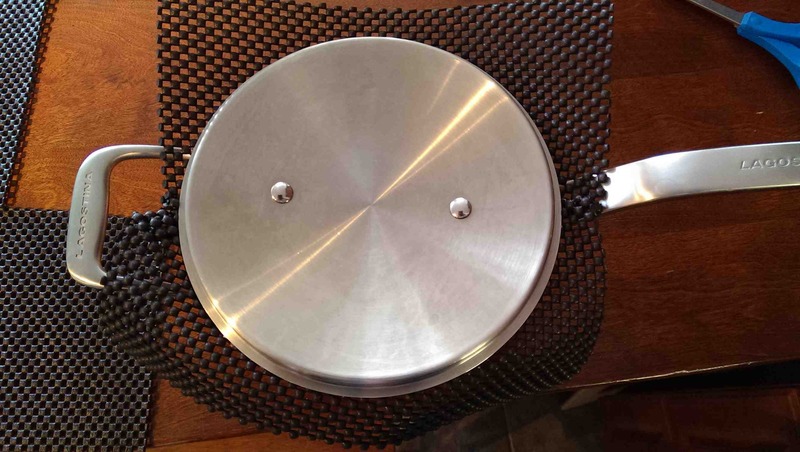 Place lid on pot with handle inside pot. 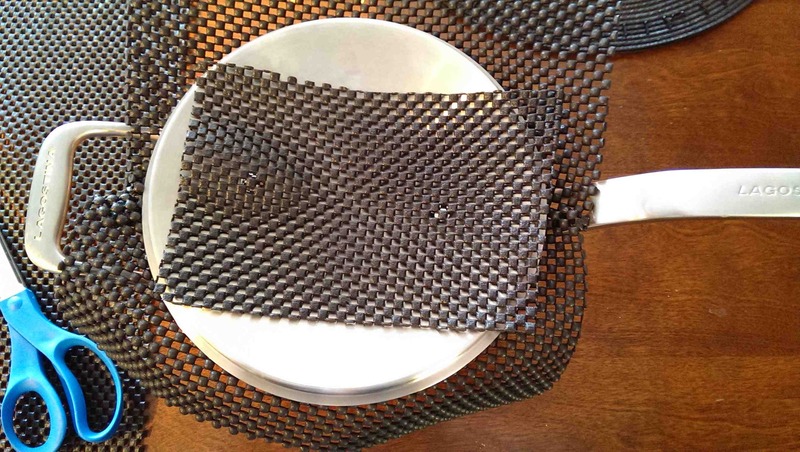 Cut extra smaller squares to place on top of each lid to prevent the pot you stack on top from shifting. Stack pots from largest to smallest. Save any extra bits to use under a cutting board to prevent them from shifting on your counter when you are using them. 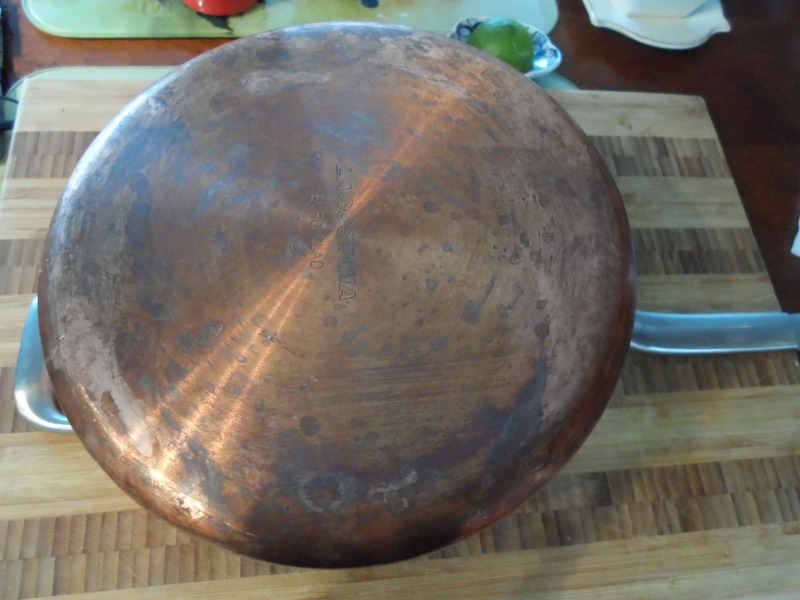 If you have other effective copper cookware cleaning methods, please don’t hesitate to drop me a line! Posted in Canadian Tire, copper cookware, Helpful Hints, Lagostina, Lemon, SaltTagged Canadian Tire, cleaning tips, copper pots, Kitchen Stuff Plus, Lagostina cookwareBookmark the permalink. I was wondering if after a year the pots were still in good condition? I’m wondering mostly about scratches. My set is still in great condition. A few scratches (I admit that I cringed after the first scratch) but it all depends on how well you take care of them. 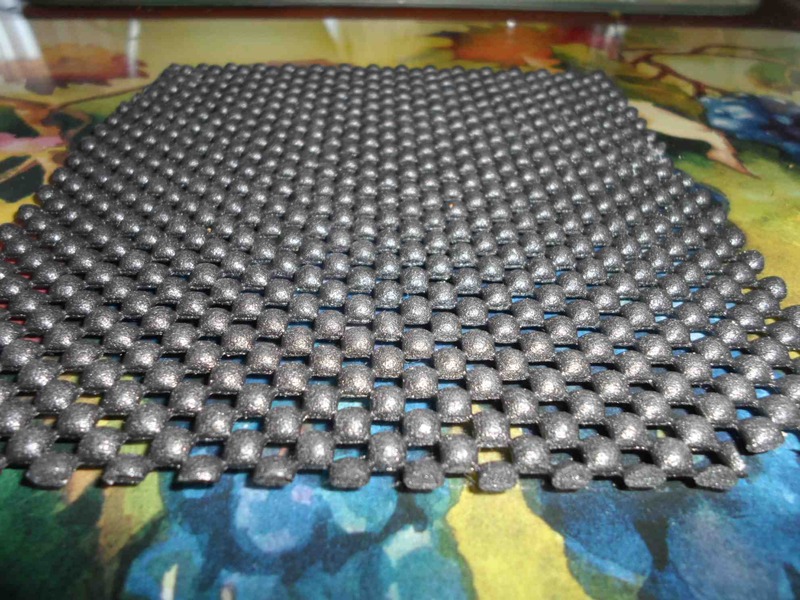 I ‘m careful how I store them and never use anything abrasive on the outside surface.